- Polycarbonate behuizing, ergonomisch ontwerp, ligt geweldig in de hand. - Die-cast chassis hufterproof behuizing en koelt de eindtrap zeer goed. - Twee "gebruikers assignable" controls met gemakkelijk bedienbare knoppen voor het instellen van de Audio output, Squelch levels enz. - 39 CTCSS and 104 DCS encode/decode. Tone scan voor het monitoren van onbekende tonen. - DTMF Auto-dialer voor autopatch toegang. Meer dan 16 karakters per groep in 9 verdeeld in 9 groepen. - SMA antenne en mogelijkheid voor het koppelen van een externe buiten antenne. - High-Capacity EBP-73 Li-ion 1200mAh battery and Drop-In charger are standard. - External DC power port supports 13.8V DC for mobile operation. Great communications start here ! Alinco has created a new 2 meter HT that sets new standards in features, convenience and easy operation. The DJ-175 sports an alphanumeric display for easy memory management. It has an ergonomic design that's "user friendly" and the 5-watt output battery is standard. Be prepared for virtually any selective calling situation or gaining access to repeaters with 39-tone CTCSS, 104 DCS, Tone-bursts and DTMF encoding, all included at No extra costs. Best of all, DJ-175 retains the proud Alinco tradition of quality construction and excellent value. Please be advised that this is a freeware (copy-right reserved by Alinco, Inc). Although we have tested this software on our Windows 2000/XP/VISTA environments and experienced no serious accidents during the operation, we are not responsible of any eventual damage caused to your radio and/or PC system by using this utility. Sorry, please do not contact us for how to use this utility; up-dates will be posted here as soon as it will be released. It is recommended that you remove the older version before you install the latest one in case of update. In case you find a bug, please report to export@alinco.co.jp specifying your OS. This software enables you to program frequencies, set parameters and save it in your PC for any version of DJ-175 (T/E/TFH). Please remember that you must have Alinco's optional ERW-4C/ERW-7 computer interface cable in order to connect the unit to your PC. A simple connection cable may not work properly. In case you install ERW-7's driver to your VISTA PC, you must be an administrator. The interface between the cable and radio is simple, just plug in the cable into the MIC port of DJ-175 before using the software and turn on the radio. After the operation, turn the unit off then remove the cable. Entering to the CLONE mode is not mandatory for this software. Find the excitement of FM-DX! Weary of regular 2m QSO via repeaters? With Alinco's new DR-03T/DR-06T, you will find exciting FM communications on high HF/Low VHF bands! Working DX is possible over thousand kilometers taking advantage of forms of propagation such as Sporadic-E, F2 reflection and scatters just to name a few. Of course even without favorable propagation conditions, repeaters will keep you communicating with friends just like on higher bands anyway. In addition DR-06T can be instantly switched from voice to 1200/9600bps packet operations, without the need for complicated TNC or swapping connections between microphones and data unit by installing optional EJ-41U TNC board. The easy and smooth operation of DR-03T/06T is inherited by world-famous DR135/235/435 series such as a large display, remote control from the multifunctional back-lit microphone, excellent transmit/receive audio and clean key layout of the control panel. Features like 100 alpha-numeric memories, front panel GPS input port, 38 CTCSS and DCS encode/decode, 3 output level setting, theft alarm, narrow FM TX, 10 auto-dialer memories, cable-clone and much more are all standard in DR-03T/06T. Compact, affordable, easy-to-use monoband rigs will make your QSO more delighted at home or on the road, so take a closer look at 10m/6m FM, take a closer look at DR-03/06! Usable with or without keypad! Imagine the ability to monitor short wave signals with this world-class performer. The world is at your fingertips, from aircraft or public safety communications to broadcast or monitoring the ham bands. Small in size but big in features, this pocket size receiver offers a selectable keyboard system so everyone from beginner to advanced listeners can enjoy its many fine qualities. Set-mode parameters enable you to customize the radio to suit your own individual monitoring preferences. The easy to use design makes it simple to program the frequencies you want and those you wish to skip during scans. You can also activate/deactivate the memory skip function on a temporary basis so you don't have to reprogram the skip setting in the memory mode every time you want to scan more frequencies. The SUPER audio quality makes it easy to catch all the action on fire, public safety, traffic and many other frequencies. You can also use it to enjoy listening to news or your favorite music on broadcast AM, FM & TV stations! Leading the way in miniature electronics technology with its revolutionary "credit card" size transceivers and multi-mode scanning receivers, Alinco once again sets a new standard for excellence with the DJ-X30. Tough Talker Speaks Volumes About Quality! Alinco combines rugged polycarbonate materials, an ergonomic design and leading edge technology in an attractive, compact full-power VHF/UHF HT that is compatible to IPX7 so it's submersible 1m/3ft. for 30 minutes! And unlike water-resistant radios you may have looked at before, the DJ-V&S17/27/47 has a large 40mm internal speaker so its audio is clean and crisp, not muffled. The superior speaker design provides 500mW max audio-output for high quality audio. With a full range of features and choice of power options, this tough talker resists rain and moisture. Take it with you when you enjoy outdoor activities such as fishing, camping, snow-sports or volunteer public radio services. * DJ-S17/S47 are available only in E-version. * DJ-V27T is available only in T-version. For more software information please visit HERE (this is a link to a third-party site). The accessories shown in the product images within this site such as microphones may differ depending on the version you purchase. The images shown here are usually the standard "T"(US/Canadian) models. Please contact your local Alinco dealer for details prior to purchase. Product intended for use by properly licensed operators. Cellular frequencies blocked in USA. 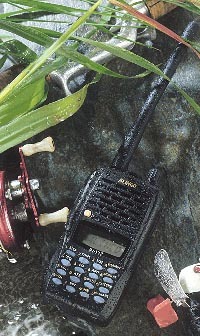 Specifications apply to Amateur Radio bands only unless otherwise specified. Permits required for MARS use. Sorry, due to the recent change in CAP requirements, modified Ham radio equipment can't be used in the CAP services unless it's type-approved. Please disregard any part that mentions about "CAP modifiable" on this site.